These things it does quite well. Particularly the first one. Ben Whishaw's voice stands out as the title role and what a perfect choice. I'm not going to mention old Colin's little story here because everyone else already has. Every shot is beautiful with colours to match the moods and so many little touches throughout (Tree). The cast is perfect, no wrong doing there. Never thought I'd see Peter Capaldi and Nicole Kidman working off of each other so well. The story overall is pretty good, basic but not entirely predictable. My only problems with this film are as follows. Some scenes feel disconnected from each other. Scenes that are meant to follow on a characters path of development or a dramatic moment will then cut to that same character dealing with something else. Or the abrupt scene where Paddington is coincidentally placed outside of the school the daughter goes to and seen as a hero. Plus some of the action scenes just didn't feel right, whether it be because the bear looks ugly in some shots and cute in others or whether it was because it seemed out of place compared to the source material. 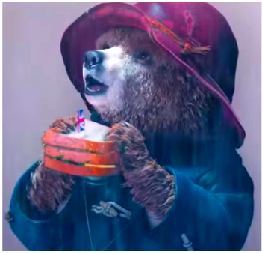 Source material aside this film gave Paddington a back story, and I really like it. It explains so much about the characters personality and growth before the films even started. It's not just a useless pre-title thingy. Even though characters did seem to jump development in personality from scene to scene, the development was still there. So with all the laughs, all the lovable characters and of course Paddington himself... this is most definitely, a rewatcher. PS: At the right angle and the right lighting, Paddington looks adorable. "